The extended stem on the bottom portion of this riser makes it a great fit for the Yamaha Super Tenere and other bikes with angled handlebar clamps. The stem of the riser was extended in order to ensure there is still enough surface area for it to bolt securely onto the bike. 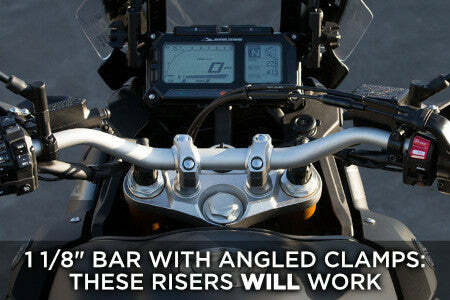 Full range of adjustment allows the rider to find their own individual bar position. Designed, Manufactured, and Assembled in the USA. Make your machine fit YOU, not the other way around. A more comfortable ride means a longer ride—and who doesn’t want that? More questions? Just call us at 218-326-1794 or send us a message here.